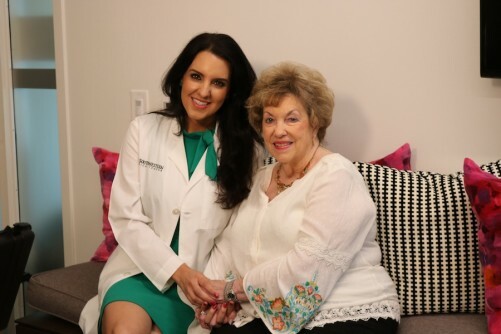 For 81-year-old Marilyn Gibson, it was a no-brainer: Would she be interested in having a single dose of radiation to treat her breast cancer instead of the standard, multiple-dose treatment delivered over several weeks? Mrs. Gibson elected to be part of a UT Southwestern Medical Center clinical trial testing a one-time, high-dose and highly focused radiation treatment called stereotactic radiotherapy for early stage breast cancer. The Arlington resident said the single-dose option works well for someone at her stage of life, who limits their driving, though she could imagine it being equally attractive to a busy younger woman who’s juggling family and work. “I want to get through it. I want to get over it, and this will be my one big contribution to mankind,” Mrs. Gibson said. After the surgery, the patient returns to the medical center for the placement of small gold seeds called fiducials, which are guides for where the radiation needs to go. About a week later, the patient returns for the treatment, which is a very high dose of radiation delivered to a very focal, localized area. The clinical trial is looking at three different dosage levels of radiation. Patients are monitored for several years after their treatment. This study builds on prior work that examined treating early-stage breast cancer with five stereotactic radiation treatments. That study, published in 2017, found that the shorter course of radiation treatments had a favorable toxicity profile and good cosmetic results. UT Southwestern has been a national leader in establishing stereotactic ablative radiotherapy, also known as SAbR, as standard treatment for prostate cancer and other cancers. According to the National Cancer Institute (NCI), 266,120 women are expected to be diagnosed with breast cancer in 2018. More than half of all breast cancer cases – 62 percent – are diagnosed early, before the cancer has spread to the lymph nodes. The five-year survival rate for breast cancer diagnosed in this early, localized stage is 99 percent, according to the NCI. But there was another reason she signed up for the trial: It’s her way of giving back, of advancing science and medicine. “This research is so important, so I’m in the right place. There’s no question about that. Oh, my gosh, I am lucky. Lucky. I am just so lucky that we were here,” Mrs. Gibson said. For more information about the study, email RO-ClinicalResearch@utsouthwestern.edu or call 214-645-8519. UT Southwestern clinical trial explores breast cancer radiation treatment in a single dose. Appl Rad Oncol.